George Brough built, perhaps, the greatest motorcycles of all time. Brough Superior motorcycles are the most sought-after collector bikes out there and with good reason: they were the result of fantastic engineering and incredible build-quality. They were the most expensive motorcycles you could buy and were the equivalent of a two-wheeled Rolls-Royce. Motorcycle production started in 1919 and continued to 1940. In 1935, George Brough decided to produce a few cars as well. The first model used a Hudson-sourced 4-litre straight-eight engine making 125 horsepower. They offered quick acceleration and a 90 mph top speed. 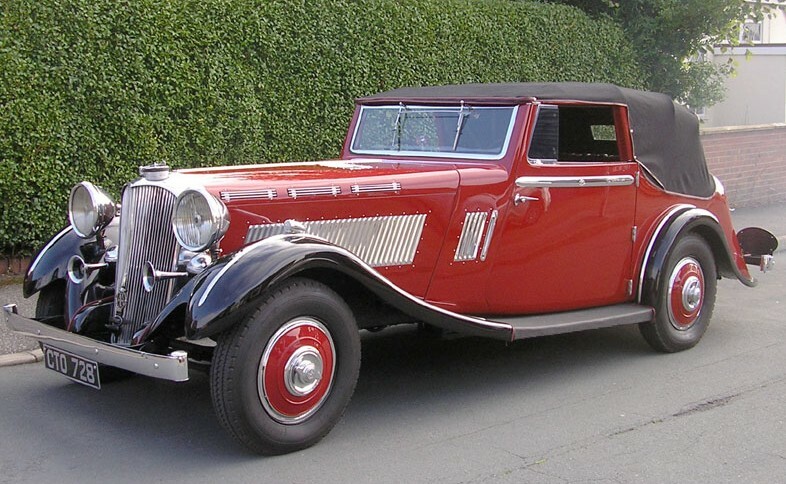 The 4-Litre lasted only through 1936 before it was replaced by a six-cylinder model. Most had this bodywork from Atcherley. Only about 20 4-Litre cars were built and only eight are known to survive (Brough Superior only built about 85 cars total). This car is “described as ‘restored. '” What’s interesting to me is that Brough Superior motorcycles, while very rare, outnumber cars by a lot to a few and bring prices very similar to the $110,000-$130,000 that this car is supposed to bring. I’ve just always assumed cars would be more expensive than motorcycles. I guess that’s not always the case, but it sure makes this car seem like a bargain. Click here for more info and here for more from H&H. This entry was posted in Uncategorized and tagged 1935, 4-litre, auctions, brough superior, cars, classic cars, convertible, dual-purpose, h&h auctions by classiccarweekly. Bookmark the permalink.